In this case, winning will have nothing to do with scoring goals, landing tries, or registering quickest times. Instead, the four teams will be tasked with achieving the lowest energy use – a combination of fuel economy and electric power consumption – driving a Toyota hybrid on the first Brighton to London Future Car Challenge. 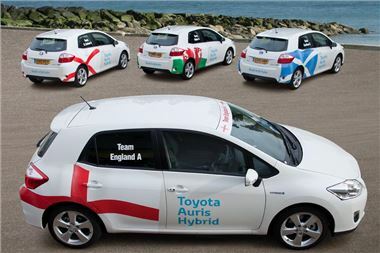 Each nation will be represented by two two-person teams, driving identical Auris HSD models, the new full hybrid hatchback that’s built in Britain at Toyota’s Burnaston factory. Given the Auris hybrid’s official combined cycle fuel consumption figure of 70.6mpg, the drivers can expect to complete the run on well under a gallon of fuel. The cars will be making a colourful splash on the 60-mile route, being decked out in patriotic national flag liveries. More than just national pride is at stake – the winners will be presented with a trophy to mark their challenge success. The competition is being held within – but separate from – the Royal Automobile Club’s inaugural future car challenge, which showcases new engine technologies for cleaner, more fuel-efficient motoring. Taking place on 6 November, the day before the annual London to Brighton Veteran Car Run, the event will be contested by current and prototype hybrid, all-electric and hydrogen fuel vehicles, as well cars powered by ultra-efficient petrol and diesel engines. Alongside the Auris HSD Nations Challenge cars, Toyota is entering three Prius – representing each generation of the world’s most popular hybrid – and the new Prius Plug-in, marking the next stage in its global development of hybrid powertrains. A ninth Auris HSD will be piloted by UK Electric Land Speed Record Holder Don Wales, and decked out in the colours of the Union Flag to emphasise the car’s “built in Britain” quality. Futurecar will also be your first chance to see the new Honda Jazz hybrid in action. and just about every vehicle due to be London Congestion Charge exempt from January will be taking part. This is truly in the spirit of the London to Brighton Veteran Car Run run (which takes place in the opposite direction on Sunday) and which originally celebrated the repeal of the Red Flag Act that compelled every motor car to be preceded by a walking man waving a red flag. Altogether over 60 zero/low-emission vehicles expected to be on the starting lines when the rally starts in Brighton on Saturday morning. Five of the vehicles are part of The Technology Strategy Board's UK-wide ultra low carbon vehicle demonstrator programme, where over 340 vehicles will be trailed and provide data for future vehicle innovation. The cars are Ecotricity's Nemesis, Mercedez Benz's Smart E, Mitsubishi's i-Miev, BMW's Mini E and two the Liberty E-Range Range Rovers, the world's first pure electric 4x4 vehicle. "It's great to get the opportunity to take part in the rally and travel to London in a Liberty E- Range Rover. I am pleased that so many of the vehicles that are taking part are also part of our Low Carbon Vehicles demonstrator programme, which forms one milestone in the journey towards low carbon vehicles becoming a reality on the UK's roads." Several world/UK debuts (including the Honda Jazz hybrid) will feature as a number of the participating manufacturers will use the event to showcase, live, their pre-production electric, plug-in hybrid, hydrogen and low-emission internal combustion engine vehicles in both passenger car and light-commercial vehicle categories. "We are pleased to have Ian Gray in our Liberty Electric E-Range for the rally. It is the world's first luxury high-performance, Pure Electric, non-polluting 4x4 that will be readily available to fill a significant gap in the family-size and luxury vehicle market. The E-Range accelerates from zero to 60 in circa 7 seconds, reaches a top speed of 100mph, and has a distance capacity of 200 miles on one single charge - this is the upper end of the drive range that any current EV is able to achieve." "In short, the vehicle enables the consumer to enjoy the power, prestige and luxury of the iconic Range Rover without the cost to the environment," says Barry Shrier, CEO of Liberty Electric Cars. More details about the RAC Future Car Challenge can be found at the official event web site at www.futurecarchallenge.com.